March 29th in Viral, Wordpress Plugins by Wordpress Jedi . So you would like to sell your own custom shirts or other products online? Online Product Designer is one of many premium plugins you can use to allow your visitors to customize their shirt on your site. The plugin is coded with jQuery and has a responsive design. It lets your visitors select and edit designs for your products. You can use this plugin to offer customizable t-shirts, caps, mugs, and other products. When you are done, you can export your design in SVG, PDF, and PNG format. The final output will be ready for DTG printers. 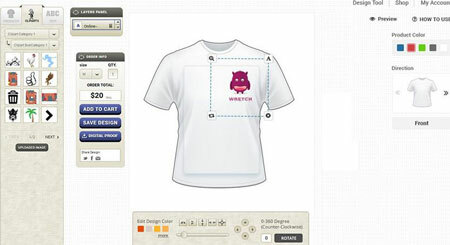 This product design tool lets you add text and graphics to your shirt and share your designs with others. It has a drag & drop interface.